While fans eagerly await the conclusion to the saga of the Infinity Stones that began in Avengers: Infinity War earlier this year, Marvel Studio has begun work on reshoots intending to wrap up Avengers 4. 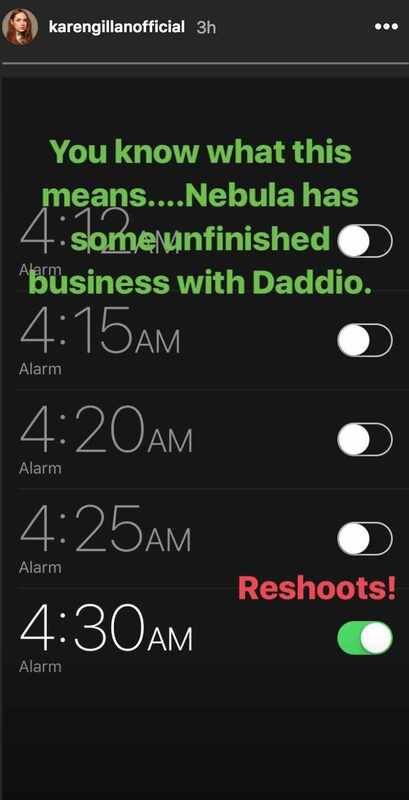 Nebula actress Karen Gillan has finally reported on set, and she is getting prepped for war against her bad purple dad. Unfortunately, that means a bunch of alarms to wake up for an early call time. Gillan posted on her Instagram story, revealing how many alarm she needs to get up. Gillan's character was one of the surviving members in the fight against Thanos, so Earth's Mightiest Heroes will need her help when they go back up against the Mad Titan. Nebula was previously featured in the promo art for Avengers 4. Despite being eight months away from premiering in theaters, the storyline for Avengers 4 might not be finalized yet. While speaking on The Marvelists podcast, co-star Mark Ruffalo said they aren't filming "reshoots," per se, but they are finalizing the film's ending. "Well we're doing reshoots starting in September," said the Hulk actor. "And then we'll go back into the international tour, we'll go on tour. Then you guys will get the second installment. Which we don't even know what it's gonna be yet. We're not just doing reshoots, we're going to finish the movie, which we really didn't get to finish totally when we left it last year." Ruffalo went onto explain the free flowing and collaborative nature of filming on Avengers 4, praising the team of directors Joe and Anthony Russo as well as writers Christopher Markus and Stephen McFeely. "I don't even know that they really know exactly," Ruffalo added. "Some of it is happening while we're there. It's pretty amazing. And we'll shoot some stuff and a few days later come back and reshoot it cause we wanna take it in another direction. It's a very living organism, even as we approach it being a locked picture, we're still working on it." But Nebula's fate might be up in the air as well, according to her Guardians of the Galaxy co-star Dave Bautista. The Drax actor said the firing of James Gunn could change where their characters end up. "I've shot most of it already. I do have two days of reshoots," Bautista said to Digital Spy. "But other than that, I have some really great scenes that I hope they use. But I guess that it remains to be seen what they'll do with the characters." We'll find out what happens when Avengers 4 premieres on May 3, 2019.